Details relating to the Slovakian Commemorative of 2016. 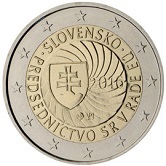 This coin honours Slovakia’s Presidency of the European Council. The Slovakian National Bank decided that the motif for the coin would be decided by a design competition. Thirteen designers, producing between them 24 designs, took part. The winning design was that of Vladimir Pavlica. Pavlica shows us the coat of arms of Slovakia against a background of fan shaped curved lines, meeting in the middle – somewhat like a turbine. This represents the important and central position played by Slovakia in this year of its presidency. To the left of the coat of arms is year of issue – 2016. At the bottom of the innermost circle are the mint mark and the initials of the designer. At the top “SLOVENSKO” (Slovakia) and around the lower half “PREDSEDN’CTVO SR V RADE” (Slovakian EU Presidency). From Slovakian Commemorative 2016 to euro coin collector.